The Horace Mann Nursery Division is located in a landmark building on the Upper East Side of Manhattan. Each year, 145 children attend the Nursery programs for threes, pre-kindergarten and kindergarten. They come from many areas of Manhattan and, on occasion, from the Bronx and Westchester, to a neighborhood that is within walking distance to Central Park and museums. 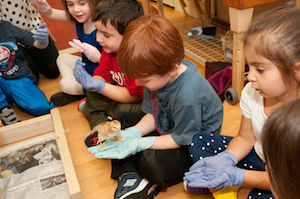 For many children and families, the Nursery Division is the first taste of what Horace Mann School has to offer. An early childhood education at the Nursery Division focuses on the child as an active, competent learner and recognizes the family’s important role in supporting this vision. The daily life in school is rich in experiences that draw on the children’s abilities and interests while stimulating new learning and curiosity. Attention to the growth and development of each child and family is a hallmark of the Nursery Division, one that forges strong relationships and supports children to make meaningful connections. At the Nursery Division, faculty work collaboratively to create a rich environment where children’s’ interest are valued and explored. This child-centered approach leads to the emergence of an in-depth curricular study. This integrated curriculum and hands-on approach is used to teach skills and concepts in the arts, fostering problem-solving ability and independent thinking. Every experience opens opportunities to explore the chosen topic as well as related topics, depending on the shared experience or special interests of the group. Children are encouraged to ask questions and to find the answers through research, experimentation, observation, and exploration. The Nursery Division faculty includes specialists in science, literacy, library, studio, music, movement and chess. The classroom teachers and specialists all work closely together to ensure that the curriculum is well-integrated and age appropriate. Our program carefully balances the integration of literacy, math, science, music and movement. Community play, math games, journal writing, yoga, and outdoor time add to the richness of the experience. Parents play an active role in their child’s experience at the Nursery Division. From chaperoning field trips to celebrating classroom and school wide events, there are many ways for our parents to participate. Faculty communicate class information through weekly newsletters. In addition, formal parent teacher conferences occur twice during the year. Parents will find that a strong and respectful partnership with their child’s teachers can help to establish the best foundation for both current and future success in school.